Royal-reference marketing connection aside, is this lipstick trio a good buy? 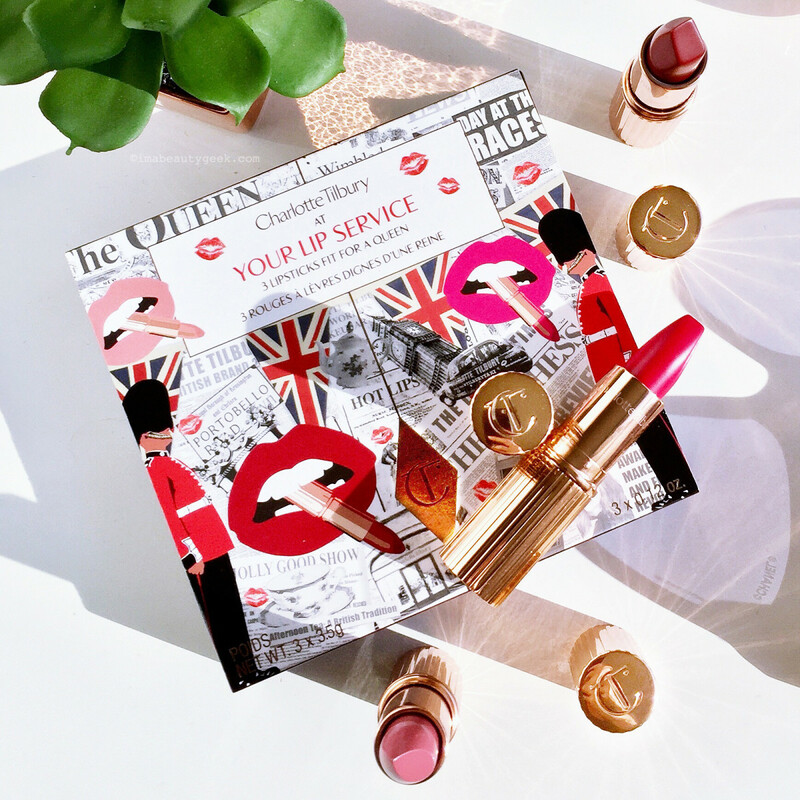 I didn&apos;t spend as much time actually watching the royal wedding – you know, the one between Prince Harry and American actor Megan Markle – as I did trying on the Charlotte Tilbury At Your Lip Service lipsticks ($100 CAD and $85 USD at charlottetilbury.com). I wish now I&apos;d set my alarm to watch the live wedding coverage because the post-airing buzz has been amazing (and I want to see more of that gorgeous, classically elegant Givenchy gown the new Duchess of Sussex – aka Princess Henry of Wales – chose for the ceremony). 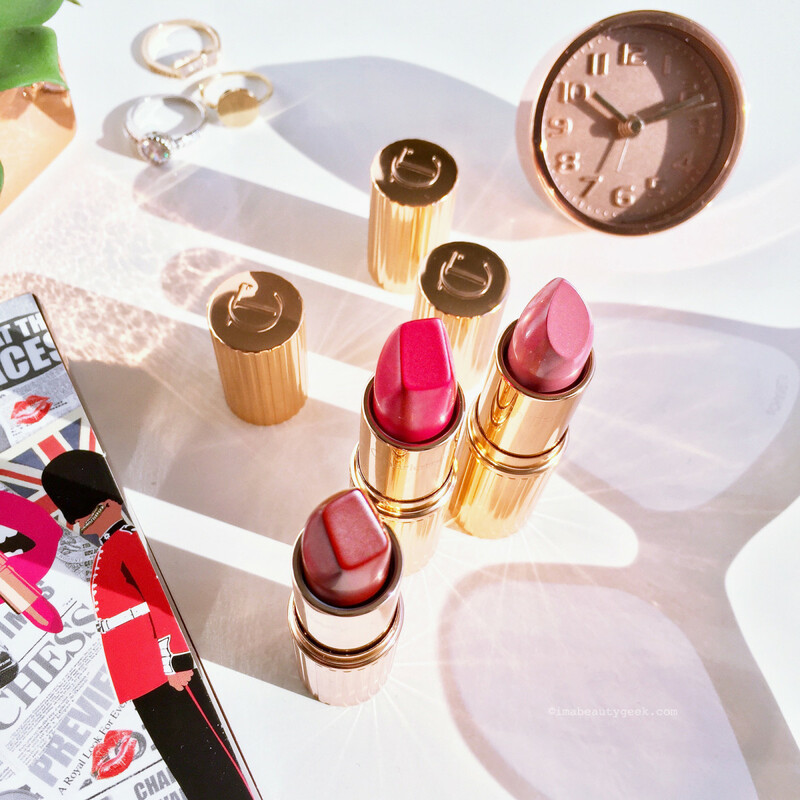 I&apos;m quite happy, though, with the time I spent trying the three lipsticks in the Charlotte Tilbury At Your Lip Service set that launched much earlier this year; I got my hands on them about a week ago. 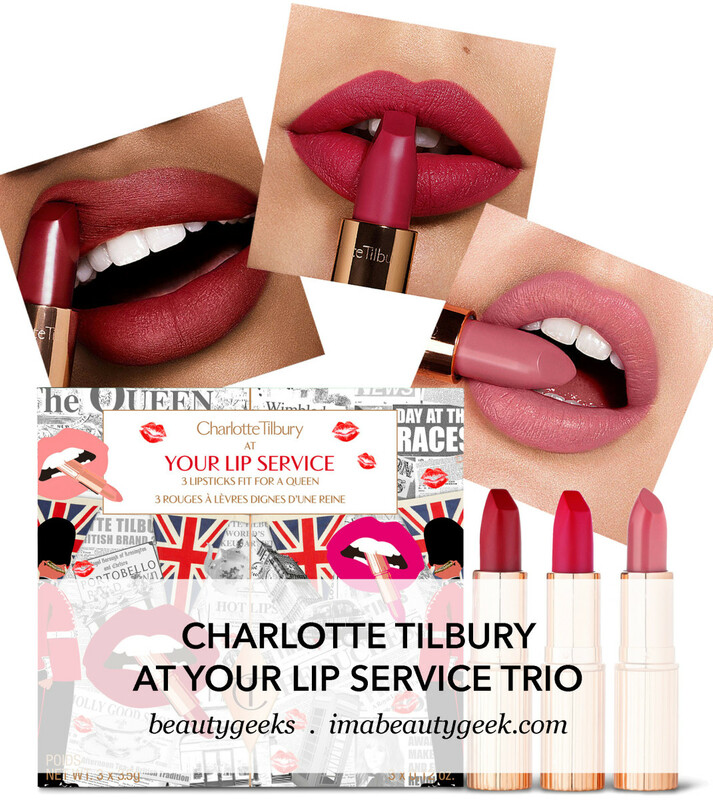 Anyway, the At Your Lip Service trio contains three Charlotte Tilbury lipsticks, two mattes and one creamy. Sold separately, each lipstick retails at $39 CAD and $34 USD; buying the trio at $100 CAD or $85 USD will save you $17. 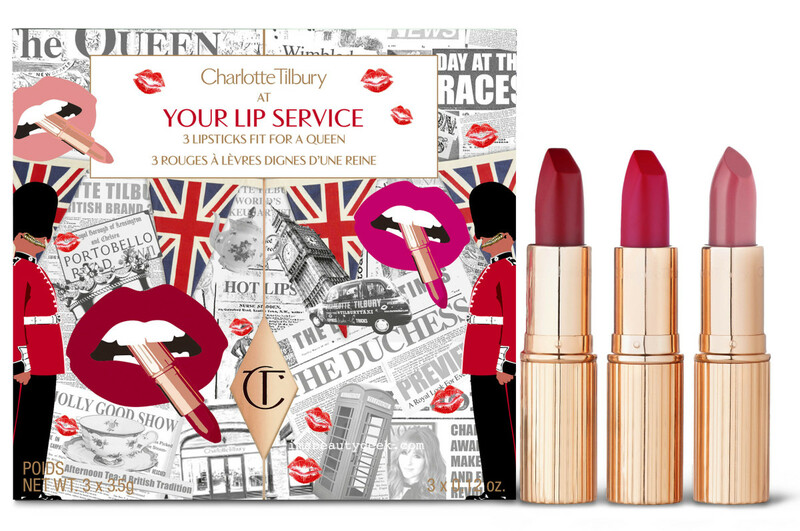 That&apos;s a decent discount if you love fancy Charlotte Tilbury lipsticks and all three shades, isn&apos;t it? Not like a free lipstick, but something along the lines of buy-two-and-get-half-off-the-third-purchase. 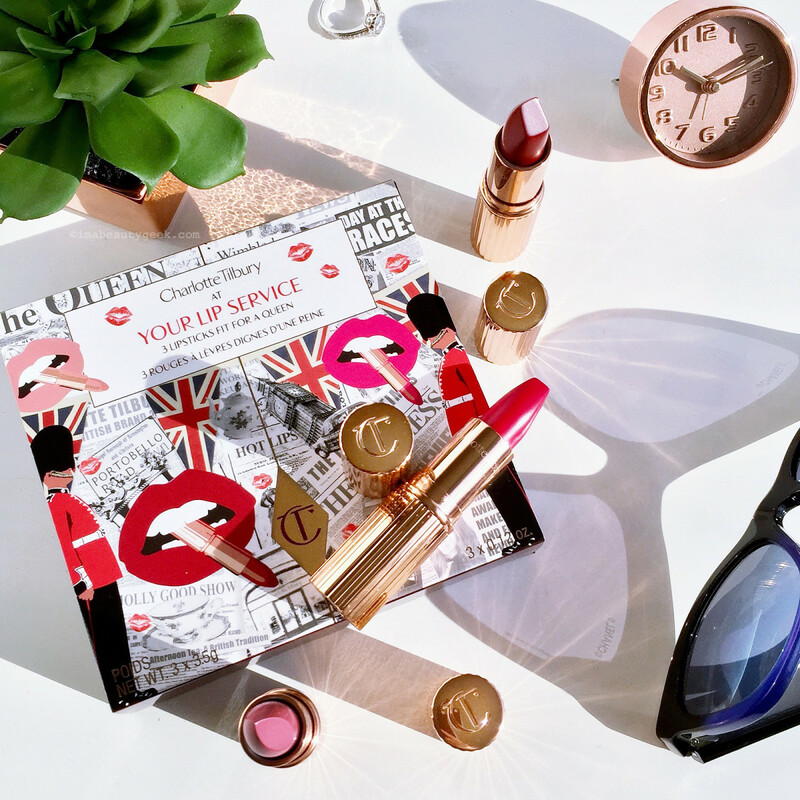 One of the Matte Revolution formulas, The Queen, made its debut last year in September and quickly became a best-seller – it&apos;s an amaaaaazing shade, perhaps my favourite of all Charlotte Tilbury lip colour hues (if you know me at all, you know at a glance which of the three it is). Legendary Queen, also a Matte Revolution formula, and The Duchess, a conditioning K.I.S.S.I.N.G. formula, made their bow in this trio back in February. 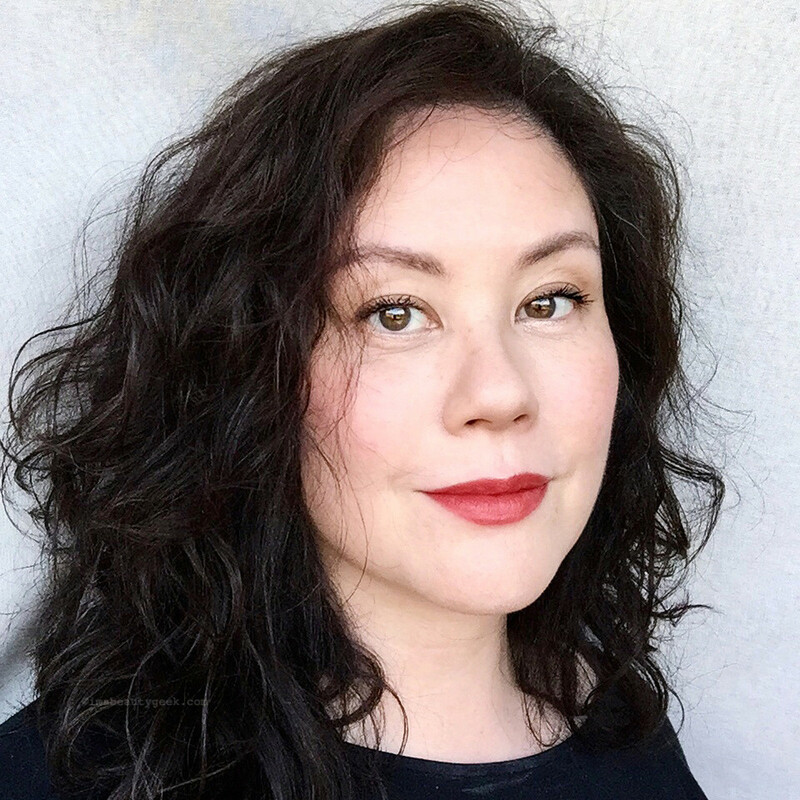 I started with The Duchess ($39 CAD and $34 USD at charlottetilbury.com), a creamy emollient-rich formula in a shade the brand calls "tea-rose pink." I&apos;m not certain whether there&apos;s an official "tea-rose pink" shade, but since I haven&apos;t already got a set idea of it I can roll with this one. Not a regular colour in my lip rotation, it is a pretty and very wearable pink for my neutral light or light/medium complexion. 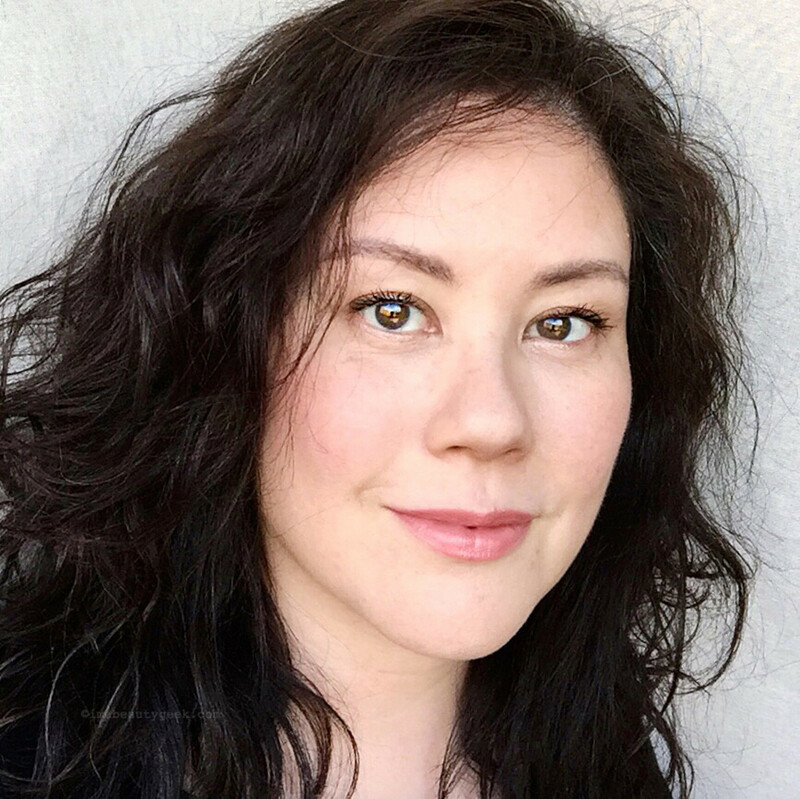 An extra layer or two would give the end result a more polished, slightly more intense finish; I&apos;ve swiped it on fairly quickly and given it an everyday-casual look with my more-dishevelled-than-I-realized hair. No surprise: Charlotte Tilbury The Queen Matte Revolution Lipstick ($39 CAD and $34 USD at charlottetilbury.com) is one of my very favourites from the brand. I favour vivid pinks over red because pink is a little more playful, and when I go red, I like a blue-based red, or a pink red like this. 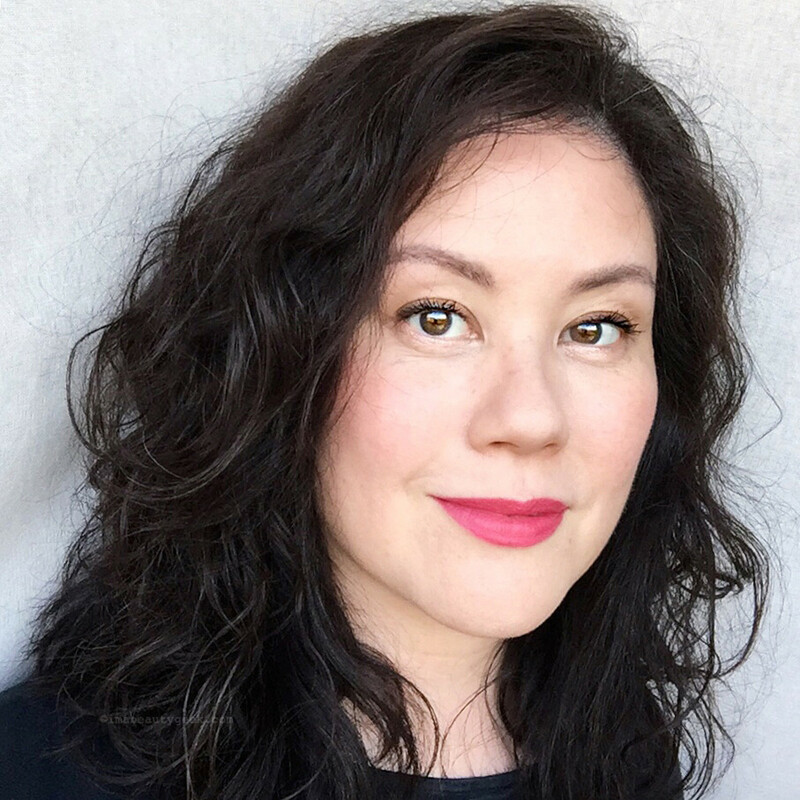 The folks at Charlotte Tilbury call The Legendary Queen Matte Revolution lipstick ($39 CAD and $34 USD at charlottetilbury.com) a "soft neutral wine." It looks a bit more brick on my monitor for some reason. Either way, it&apos;s red with a warm undertone – not my favourite shade of red although I do think it works with my skin tone. As I did with The Queen, here I applied a couple of layers from the tube, and rubbed gently with my fingertip to soften the finish. The rest of my makeup is the same for all three images. 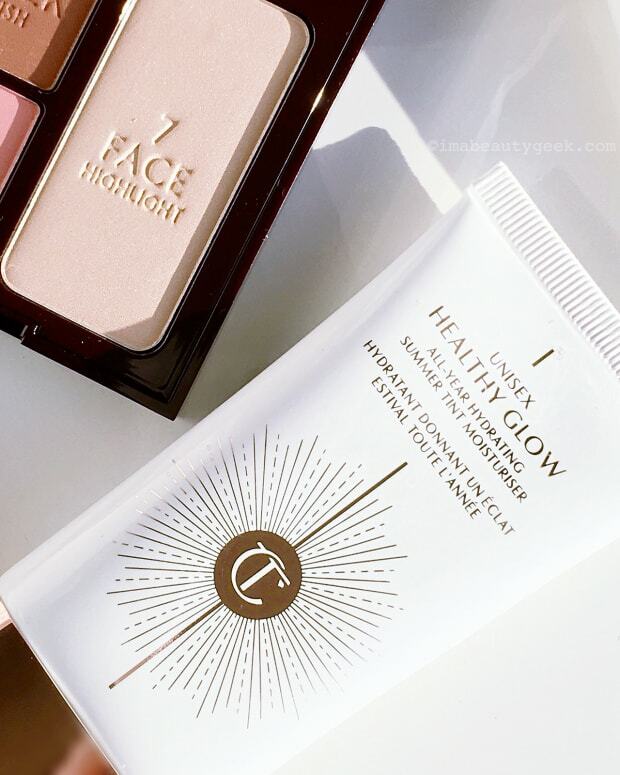 So is this Charlotte Tilbury At Your Service trio a good buy? For me the answer&apos;s not that simple. Although it&apos;s a nice selection of shades for any occasion, and I adore The Queen, I&apos;d probably not have bought The Duchess or Legendary Queen for myself. Now that I&apos;ve actually tried The Duchess, though, I&apos;ll wear it for sure; it&apos;s a pretty, non-committal everyday shade, and a good option with a smoky eye if I go that route. Legendary Queen, however, I&apos;m unlikely to wear again. I prefer cooler and neutral shades, and although the brand calls it a "neutral wine," it&apos;s still a bit too far on the warm scale for my taste. I&apos;ll give it to my mum, though – it&apos;ll look really good with her complexion, which is a couple of shades deeper than mine. If you think $39 or $34 is a crazy amount of cash to blow on a lipstick in the first place, and the idea of spending $100 CAD or $85 USD on three of them makes you quake, then of course this set isn&apos;t for you, even with a $17-discount. I&apos;m sure there are much less expensive formulas in similar shades out there, although I haven&apos;t got any suggestions off the top of my head. By the way, Charlotte Tilbury lists both of these lipsticks as "vegan friendly" and cruelty-free. You may have heard that the brand is now available in Hong Kong, but that doesn&apos;t affect its no-animal-testing positioning. According to the above Insta-post, "Hong Kong is exempt from China&apos;s regulatory requirements regarding animal testing." 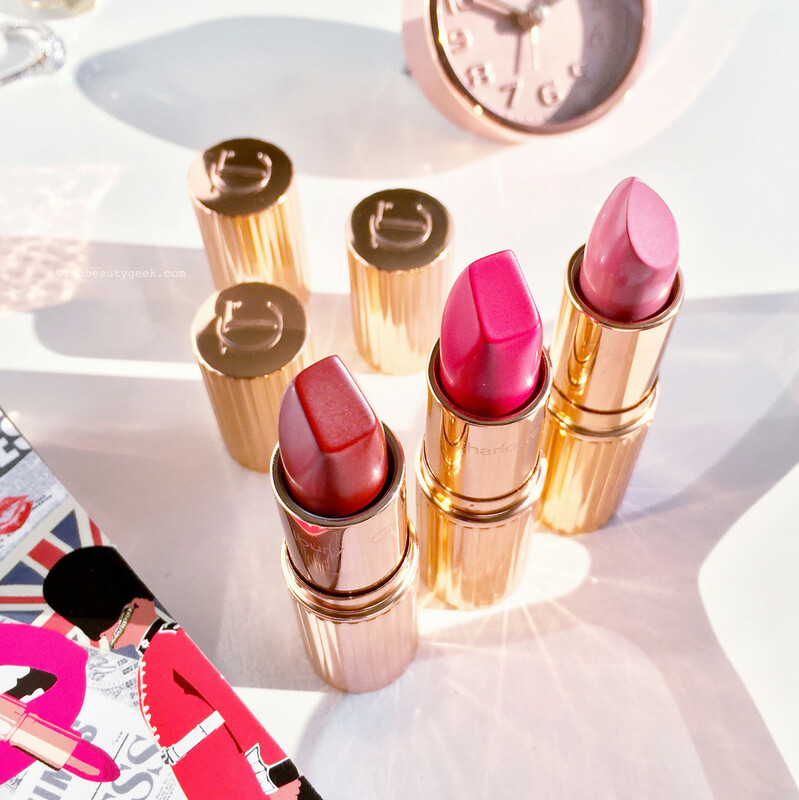 Have you tried any Charlotte Tilbury lipsticks? Do any of the shades in this trio appeal to you? Would you call this set a good buy? And of course if you have dupe suggestions, we&apos;d love them in the comments! 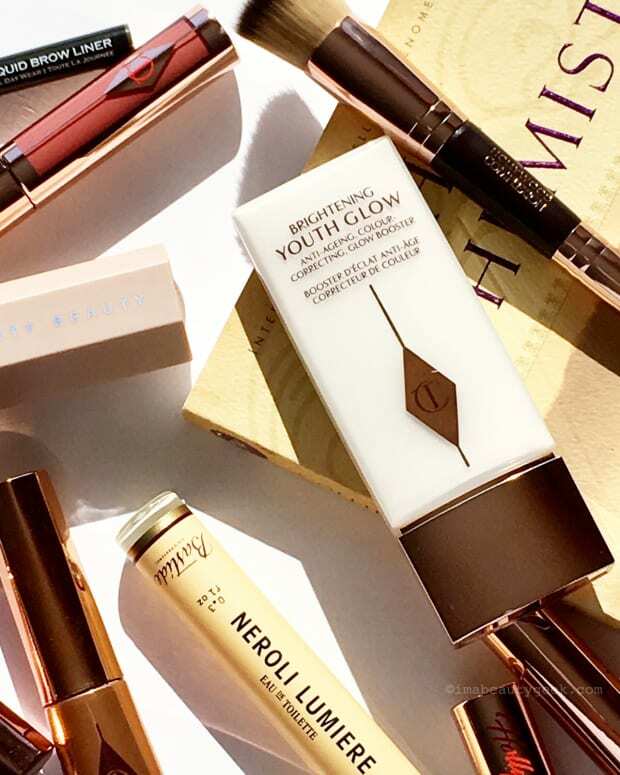 CHARLOTTE TILBURY MATTE REVOLUTION LIPSTICK ingredients: Neopentyl Glycol Dicaprylate/Dicaprate, Trimethylolpropane Triisostearate, Dimethicone, Cera Microcristallina/Cire Microcristalline, Polyethylene, Polybutene, Dimethicone Crosspolymer, Silica, Mica, Dicalcium Phosphate, Ethyl Vanillin, Caprylic/Capric Triglyceride, Tocopherol, Carthamus Tinctorius (Safflower) Seed Oil, Zea Mays (Corn) Oil, Pentaerythrityl Tetra-Dl-T-Butyl Hydroxyhydrocinnamate, Carica Papaya (Papaya) Fruit Extract, Orchis Mascula Flower Extract, Bixa Orellana Seed Extract, Bht, Tocopheryl Acetate, Tin Oxide, [May Contain/Peut Contenir (+/-): Titanium Dioxide (Ci 77891), Iron Oxides (Ci 77491, Ci 77492, Ci 77499), Red 7 Lake (Ci 15850), Red 6 (Ci 15850), Yellow 5 Lake (Ci 19140), Yellow 6 Lake (Ci 15985), Red 28 Lake (Ci 45410), Blue 1 Lake (Ci 42090)]. CHARLOTTE TILBURY K.I.S.S.I.N.G. LIPSTICK ingredients: Octyldodecanol, Polybutene, Pentaerythrityl Tetraisostearate, Ethylene/Propylene Copolymer, Caprylic/Capric Triglyceride, Vp/Hexadecene Copolymer, Diisostearyl Malate, Silica, Dicalcium Phosphate, Hydrogenated Styrene/Methyl Styrene/Indene Copolymer, Mica, Ozokerite, Stearalkonium Bentonite, Propylene Carbonate, Pentaerythrityl Tetra-Di-T-Butyl Hydroxyhydrocinnamate, Crambe Abyssinica Seed Oil, Ethyl Vanillin, Bixa Orellana Seed Extract, Bht, Tin Oxide, [May Contain/Peut Contenir (+/-): Titanium Dioxide (Ci 77891), Iron Oxides (Ci 77491, Ci 77492, Ci 77499), Red 6 (Ci 15850), Red 7 (Ci 15850), Red 7 Lake (Ci 15850), Red 28 Lake (Ci 45410), Red 30 Lake (Ci 73360), Yellow 5 Lake (Ci 19140), Yellow 6 Lake (Ci 15985), Blue 1 Lake (Ci 42090)].